Almost all the characters in my story in this one pic: I forgot one, but most likely, he will be given a character bio. 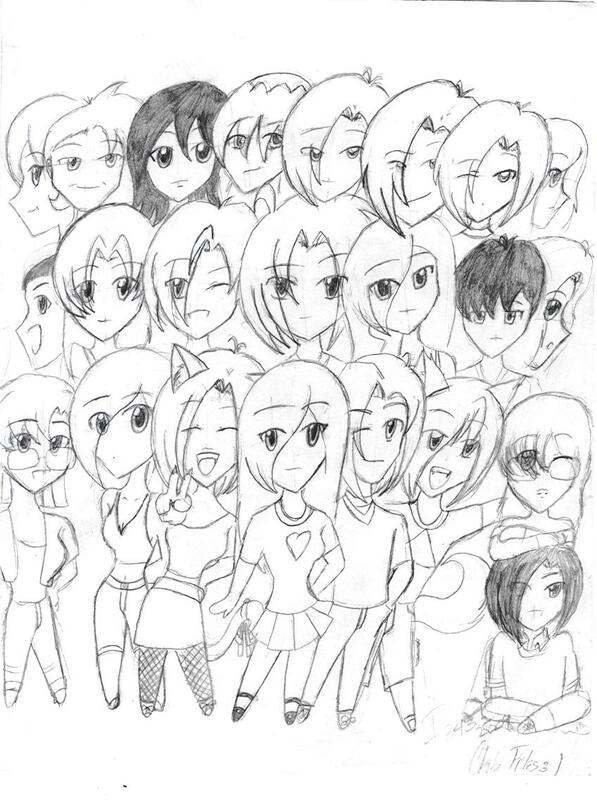 Top Row: (left to right) Nurse Sawachika (school nurse), Nathan Kartuga (Tara's father), Natasha Kartuga (Tara's mother), Emery Jones (Tara's #1 enemy), Ratelle, Ralph and Ray Valdez (Maria's brothers, triplets), Karen Clark (Cecilia's younger sister). Bottom Row: (l to r) Sarah Williams (Tara's and Tia's BFF), Kira Kortez (Maria's BFF), Tika Morthy (Blaine's ex, new at school), Tara Kartuga (Main Character), Blaine Matthews(Matthew's BFF, new, Tika's ex), Matthew Burns (Blaine's BFF, new), Cecilia Clark (Karen's older sis, Dru's girlfriend) who is on top of Dru Takano (Cecilia's boyfriend, "Most Popular" sophomore in school). Notes: Yes, there is difference between Tika having an ex and Tuesday having a former girlfriend. Info will be revealed in the story. And "new" for Blaine and Matthew, will not necessarily mean new to the storyline. Date Submitted September 1, 2009, 4:47:58 PM Time Taken 45 min.